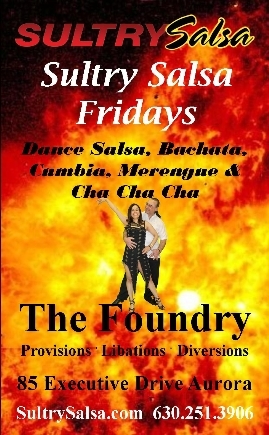 Sultry Salsa Fridays with El BarÃ³n, Jed Walker! Bringing Sultry Salsa to the Suburbs. Dance Salsa, Merengue, Bachata Cha Cha Cha & Cumbia to music brought to you by DJ Mario Flores aka DJ KaBoom until 2:00 AM! 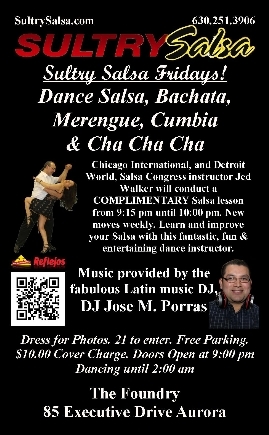 The fun starts at 9:15 pm with a FREE Salsa lesson with Chicago International, and Detroit World, Salsa Congress instructor Jed Walker. Exciting new dance moves that you can use every day taught every week. Learn and improve your Salsa with this fantastic, fun and entertaining dance instructor. NO PARTNER IS NECESSARY as we rotate partners throughout the lesson so by the time the dancing starts you already know a lot of people. LET'S DANCE! Dancing until 2:00 am at The Foundry. 21 and over to enter. Huge, free parking lot. Dress for Photos. El BarÃ³n will be taking photos every week and posting them to his website for you to download with his compliments. If you do not receive our emails with the links to the current photos pages be sure to sign up now. On the south side of the Fox Valley Mall. Special event pricing may vary. simply click on the flyer. 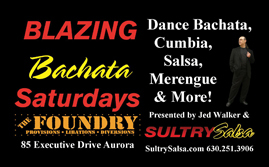 Blazing Bachata Saturdays with El BarÃ³n, Jed Walker! Dance Bachata, Cumbia, Salsa, Merengue & Cha Cha Cha to music brought to you by DJ Incognito until 2:00 AM! The fun starts at 9:15 pm with a FREE Bachata lesson with Chicago International, and Detroit World, Salsa Congress instructor Jed Walker. Exciting new dance moves that you can use every day taught every week. 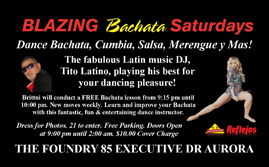 Learn and improve your Bachata with this fantastic, fun and entertaining dance instructor. NO PARTNER IS NECESSARY as we rotate partners throughout the lesson so by the time the dancing starts you already know a lot of people.